I don’t have a formula for composition, obviously. I like simplicity, I like abstraction. I like foggy mystery, but also piercing clarity. I’m happy enough sometimes to simply represent something interesting, but mostly I’m looking to move the eye around a space, and to move the mind with it. More and more (though I always have), I think of art as being a reflection of, or projection of, mind. Mind doesn’t really have a form or shape or color, as any meditator or neuroscientist knows. But somehow I feel like a state of mind (always transitory and fleeting) can have a graphical representation. A lot of modern art is interesting to me not purely because of color and form, but because of Mind. Kandinsky is a different state of mind — when viewing the painting you are in a different state of mind — than say in front of a Rothko. 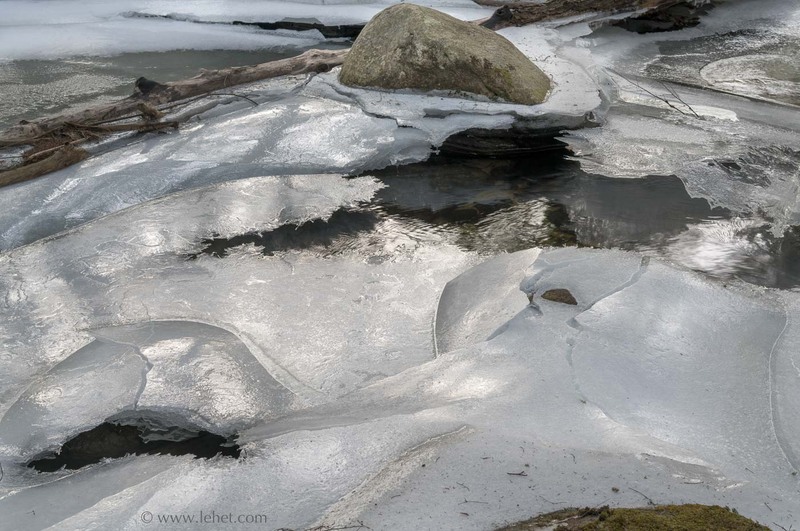 Photographing ice on a winter stream is always an opportunity to explore a lot of mental states, a lot of chances for simplicity, tranquility, and also more kinetic and energetic situations. I like this one, for now, because it has about as much energy, form, texture, detail, as I dare squeeze into a photo. The eye moves around the image; it’s not a simple, settled thing. Like Kandinsky paintings, the mind can be this way too. It’s worth spending time with it, whether it is a Rothko or a Kandinsky. This is a stream in New Hampshire that I particularly like to walk along, because there is a nice trail along it, and the stream is interesting — sometimes slow, sometimes fast, sometimes even a waterfall. The stream is a mind of its own, moving through all the states and shapes and form that a real mind will, and always changing. In winter here, pretty much any day will be different from the next in terms of how a stream like this will look, and of course the light changes through the day too. It is as fleeting as a one day flower, a dandelion head in a breeze, a human mood or set of thoughts. This entry was posted in Abstract, Ice, Landscape, Meditation, Musings, New England, New Hampshire, Water on February 8, 2018 by john lehet.